Vice President Leni Robredo backed out meeting Duterte? 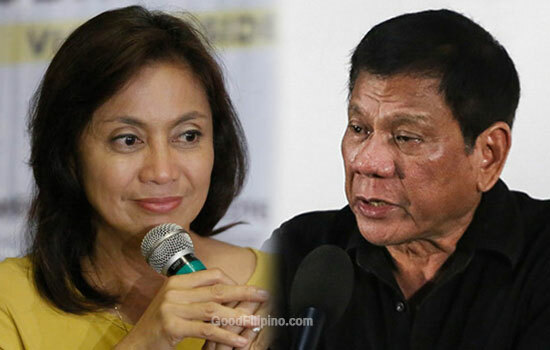 Home » Duterte Inauguration » Leni Robredo » Politics » President Rody Duterte » Rodrigo Duterte » Vice President Leni Robredo backed out meeting Duterte? The incoming vice president of the Philippines backed out on meeting the president-elect Rodrigo Duterte due to unexpected circumstances. Bong Go, executive assistant of the incoming president stated that to TV5 reporter on Wednesday, June 29, 2016. According to the longtime former Davao City mayor’s aide said that the two high officials will supposed to meet in Davao City but Leni Robredo have already schedule to travel to Japan. ABS-CBN News reported that VP-elect Robredo visited Tokyo over the weekend for the National Day Celebration for the Filipino Community in Japan. On the other hand, today is the day of the inauguration ceremony of the 16th president of the Philippines. June 30, 2016 is not a special holiday and this is also a rare moments of having 'two president' in one country. Incoming president Rodrigo Duterte's inauguration and incoming vice president Leni Robredo's inauguration will be hold in a separate venue today. When do you think will be the next meeting of the two high officials of the country? Please share your thoughts below. Comments or suggestions about "Vice President Leni Robredo backed out meeting Duterte?" is important to us, you may share it by using the comment box below.